You’ve read Jay’s great piece on the move, but I wanted to chime in with my thoughts and discuss the strategy of the move in more detail. First, Seager’s got a short, quick, level swing that he used to ping line drives around Cheney Stadium when I saw him. That’s great; I’m generally pro line-drive, but it actually makes it harder to know what to expect. He’s not going to hit for much power (the HR he hit at Cheney was a routine fly hit into a strong wind), but his eye should help him post an OBP well above that posted by the M’s left fielders, and easily above the incumbent at 3B, Chone Figgins. He struggled a bit against left-handers, just as Ackley did initially in AAA, but that almost sounds like nit-picking when he put up a .523/.571/.795 line against right-handers. The Angels start four righties in the upcoming series, by the way. In some ways, this is an ideal situation for Seager. He’s playing in the same infield as his elementary school friend/rival, the guy he’s replacing is putting up one of the worst seasons in M’s history and is widely reviled by M’s fans, and he’s playing for an org that clearly doesn’t mind a 3B without HR power. On the other hand, he’s going to be making his debut in an absolutely crucial four-game series against a division rival at a time when the M’s are within 4 games of the division lead. The M’s clearly thought that playing a talented hitter in this series meant a lot more than playing a veteran hitter, and that’s a sentiment I’m sympathetic to. But let’s be clear: the M’s think the best chance they have to stay in a wide-open AL West race is to call up a 23 year old 2B who’s played two weeks in AAA, and a half-season in the high minors. I agree with their decision, but I don’t like what that says about this team. 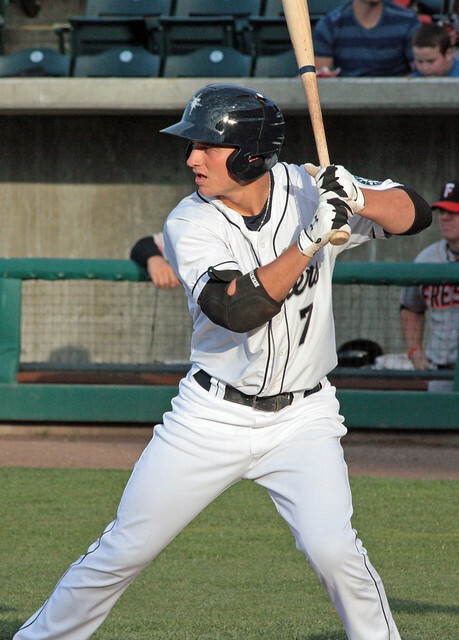 Kyle Seager moved to 2B upon signing with the M’s, and he spent 2010 there for High Desert. This year, he played 2B for Jackson, then starting playing more 3B in Tacoma (as Jay mentioned). He played the position in college, so it’s not like he’ll forget which base to throw to, but he doesn’t have the arm strength of an Alex Liddi; David Bell may be a decent comp. In any event, the M’s aren’t turning to Seager for his glove, and Figgins has been so shaky defensively this year that it’s not at all clear that Seager will be a downgrade. Still, if you’ve been nervous about position switching, then this has to be something of a red flag. The M’s moved Figgins off of 3B, but he had much more professional experience at 2B than Seager has at 3B. He’s been very solid since his promotion to Tacoma, but we’re talking about six games and a smattering of chances. In short, the M’s probably aren’t making this move because they’re smitten with the BABIP-driven video-game slash line Seager’s produced in Tacoma. They’re making the move because they’re desperate, and their offense is comically bad. So yes, Seager’s not terribly experienced at 3B (at least in professional ball), but they’re almost certainly right that he’ll be of more use than Figgins. I’m happy that the M’s system has options to help the ballclub beyond the consensus top 5 guys, but what does it say when a guy like Kyle Seager would hypothetically upgrade several positions in the M’s line-up? The player development group should be praised for Seager’s breakout, but what does it say that no one who started the year as a 3B could fill the role? I was impressed by Seager, and hope he has at least as much success as Dustin Ackley’s had in his first tour of MLB, but for every positive statement you can make about this specific move, you can make a negative one about this move’s context. Welcome to the show, Kyle. Keep the M’s in the divisional race, would you? Desperation isn’t bad. 1951 Le Durocher brought up a very green, 20-year-old Willie Mays and put him in center, moved Bobby Thomson to 3rd and Whitey Lockman to 1st. He said he wasn’t a genius, he was desperate. Desperation makes for diving catches and guys stealing home … and teams finally realizing they can’t rest on laurels. Let’s say no Seager and somehow the Ms make the playoffs (somehow). Do we wait for a Bill Buckner moment to remind us that we have major flaws. Time to pull the trigger!! Seager is not that young. He WILL contribute, and it might work out bigger and better than you could ever imagine. So what if they’re desperate? It’s exciting and it’s a breath of fresh air, to see moves like this made. The “what ifs” can go either way, but the bottom line is, we get to see a new face who has a clean record! I agree that it isn’t Ryan’s fault that he finds himself batting in the 2 hole…but ESPN, MLB and Baseball Reference agree that he is carrying a .526 OPS, batting second in the order. And we don’t really have anyone to replace him right now. Ackley will at some point, but sadly he is needed in more of a run-producing spot now. If we somehow acquired a middle of the order type bat, then Ackley could foreseeably move to #2 and Ryan down to 8 or 9.